Since its debut in 2010, Instagram has had a meteoric rise in popularity. Today there are over 150 million active Instagram users worldwide. That actually makes Instagram MORE active than the digital marketing darling, Pinterest. With so many people waiting to see your brand’s message, all that’s left is for you to get started, and that’s where we come in. This getting started guide will give you everything you need to get set up and sharing in no time. At its most basic, Instagram is a social media platform with the same potential for networking, engagement and sharing that you find in Twitter. The main difference is that Instagram focuses (and restricts you to) visual content. 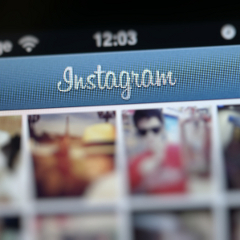 Instagram users can post photos and short videos (15 seconds max) accompanied by a caption. Visually display your products – Take and post pictures of your products (and you get non-redeemable virtual bonus points for taking pictures of them in use and not just on a shelf somewhere). Interact and engage with your customers – Like the other major social platforms, Instagram is a great way for you to engage with your customers. The visual media lets you play with new and interesting ways of getting through, too. While Instagram has a lot of similarities to the other social networks, it’s important to remember that it’s not the same network. When you’re creating Instagram content, you need to stay in-line with the platform and what the platform users expect. Your Instagram followers are looking for appealing, interesting perspectives instead of informative content. This is the right place to get really creative, and maybe even a little experimental with what you post. Just remember that you’re trying to help potential customers relate to you and your products and then let yourself loose. Rignite Insight: As we’ve mentioned (and mentioned [and mentioned]), Instagram is a visual platform. As a brand, that means your posts need to be high-quality and professional-looking. You don’t have to hire out a studio or “photographic artist,” but be sure your pictures aren’t blurry and any added effects don’t have rasterized jaggies. In a world of text lingo and at least 43 different ways of making smiley faces, the ubiquitous #-symbol has a place all in its own. Any word or phrase started with the #-symbol becomes a hashtag. Hashtags are used to connect a group of posts according to a specific topic. They make searching fast and efficient, and make your posts easier for other people to find and share. Rignite Insight: Keep your hashtags short and do not put spaces in them. When you add a space, the hashtag ends and #ScrewingAroundWithCraftsman becomes just #Screwing (a very different sort of search, we assure you). Because they’re a powerful tool, it will become tempting to use popular hashtags in every post. Save yourself (and your viewing audience) some headaches and just don’t. Make sure the hashtag you use is relevant to your industry and your post. Don’t latch onto the current trend of the moment unless it’s directly related to your post. The hashtags made it quick and easy for them to reach their target audience while they were looking for posts about their favorite teams. As with any content platform, you want to follow the 80/20 rule with your posts (80% non-promotional/20% promotional content). Instead of only posting “deals”, be sure to also situate your product in an interesting photo setting. Consider posting images that don’t include your product at all, but are of interest to followers. Are you on a vacation in Europe, or perhaps at an industry trade show? Post some pictures and let your audience live vicariously through you. Also consider sharing photos of the people behind your brand, like staff members having a good time. Just remember to use discretion – posting embarrassing pictures from your office party will not win you friends, inside your company or out. Unlike Twitter or Facebook, you don’t need (or want) to post to Instagram as often to be effective. Once or twice a week is plenty. For a special occasion or at an event, you might increase the frequency, but the general posting frequency is still below that of Facebook (and WELL below that of Twitter). Getting Started on Instagram is as easy as creating an account and starting to create images, but doing it right takes a bit more planning and forethought. Get yourself up and snapping and you’ll be connecting with your customers in a whole new way. Tell us: What ways have you found to be most effective in promoting your business on Instagram? The main problem for Business in Instagram is where to get first 5-10k followers. So, i recommend to use some services which offers followers. But be careful: use ONLY real followers. Otherwise, you will be banned.